In one of National Solidarity Party's press statement released after Singaporeans experiencing frequent flooding in Singapore, we have recommended the PAP government to consider subsidizing individual households and small businesses who are adversely affected by the floods. However, PAP government has not responded, neither did the main stream media dare to publish anything about it. It seems that not only the British government has implemented the flood gate installation program, even the Taiwanese government has praised the effectiveness of such implementation of the flood gates. Deputy Executive Director Chern Jenn-chuan of the Southern Office of the Morakot Post-Disaster Reconstruction Council said August 27 that in order to improve flood-prevention capabilities of people in disaster areas, Premier Liu Chao-shiuan had directed the Construction and Planning Agency (CPA) of the Ministry of the Interior to provide full subsidies for installation of floodgates in Linbian and Jiadong townships. The CPA shall also oversee local government polling of township residents as soon as possible concerning their willingness to erect floodgates. As long as residents are willing, the CPA shall call on existing contract floodgate vendors to complete installation within seven days. Chern went on to explain that Linbian and Jiadong are low-lying areas of Pingtung County, so the public in these rural townships should remain on high alert before the water has fully receded in order to cut post-disaster risks. He stressed that Premier Liu has instructed that comprehensive disaster response preparations be completed at both the central and local government levels to reduce future disaster damage or losses. About nine years ago, Jame Gomez was talking about "New Poor" in Workers Party's various rallies. But after nine years down the road, many people are talking about "Working Poor". i.e. It is no longer "New" but just as any other average guy or gal in the work force who are now considered as "Poor". What has happened throughout this period that created this Working Poor phenomenon? The widening gap of income inequality caused by Globalization as well as ultra-capitalism has taken its toll on the middle class in all societies. The changing of labour conditions also caused a great diminishing middle class in many societies, including Singapore. Karl Marx has predicted the eventuality of the diminishing middle class which will create social class struggle within an economy, if Capitalism is allowed to go to the fullest extreme and unregulated or checked. This is especially so in Singapore when our country is just a little red dot on Earth. There will always be "Cheapest, Fasterest, Betterest" labour else where who are willing to come to work in Singapore. There are billions of people on Earth and Singapore only need a few millions of them. What it would mean to Singaporeans is that without proper checks and control, each and everyone of us could be replaced by some other "Foreign Talents". Our wages will be forever suppressed or stagnant, which is the case right now. In spite of wonderful Economic Growth, the real income of the working class has stagnated in the past 10 years. Some even face depression of wages and some, worst, retrenched and face either structural unemployment or simply underemployment. Thus, our Working Poor emerges. The problems of Working Poor will continue to deteriorate in the years to come in Singapore. Without a proper social safety net, we will face more Singaporeans being displaced by the "Cheapest, Fasterest, Betterest" Foreign Labour. Wages will continue to be suppressed while cost of living will continue to rise, mainly due to higher rental charges. Standards and quality of living will go down while cost of living goes up. Jobs is no longer a problem; Jobs that pay enough to sustain decent livelihood will be the main problem. It is under such circumstances that places like Hong Kong and Malaysia are setting minimum wages for their vulnerable group of workers. The widening income gap is the main concern that this PAP government has refused to acknowledge. If this is allow to carry on, social tension will mount. What will become of Singapore? I really don't want to imagine. 1) Singaporeans can no longer afford a decent HDB flat. It takes two income earners to take up a 30 years mortgage to pay for a decent HDB flat. Singaporeans may need to pay a 35 years or even 40 years mortgage if things carry on like this. 2) There will not be enough CPF savings for retirement for 80% of Singaporeans. 3) Singaporeans will have no retirement at all and will have to work until the day they die. This is what PAP and the Main Stream Media trying to "mentally condition" Singaporeans into believing that working until death is "NORMAL" or even "GOOD FOR YOU". 4) There will be more people living in poverty when they get older. Well, new definition of poverty will emerge. 5) Social instability. There are already ground grumbles and whispers of great discontent on the ground. If this carries on without proper social safety net being set up, I really don't dare to imagine what will happen in the near future. Casino levy to be RAISED after the elections? Yesterday, Minister Vivian Balakrishnan released some startling statistics. According to media reports, more 1 million visits to the casino have been made by Singaporeans in the past 7 months. Based on these numbers, it is obvious that the bulk of the record profits reported by the casinos are being earned from Singaporeans rather than foreigners. As an immediate stop gap measure, the Casino Regulatory Authority (CRA) has issued directives to stop the casino from engaging in activities that encourage Singaporeans to visit the casinos. These include free shuttle rides to the casinos and media releases that showcase big winnings by gamblers. In the longer run, it is obvious that these stop gap measures will have only a limited impact . There are more than 1 million visits to the casino in the past 7 months are made by Singaporeans. It appears the exiting levy ($100 per 24 hours and $2000 per year) is NOT having the desired effect of deterring Singaporeans from visiting the casino. WILL THE LEVY BE RAISED AFTER THE ELECTIONS ARE OVER? If there are no plans to raise the levy, Minister Balakrishnan should state this clearly. If the number of Singaporean gamblers continues to surge and we start seeing a large number of broken families due to problem gambling, we can then hold Minister Balakrishnan accountable for having failed to manage the social problems of the casinos. 1) What is the total number of visits by foreigners to the casinos within the same period of time? This figure is important for us to assess on whether these casinos are “successful” in attracting MORE foreigners than Singaporeans. The KPI for this success is for every local Singaporean patrons, the casinos should attract 4 foreign patrons (20-80 ratio). 2) I would like to know the number of Singaporean who have signed up the $2000 yearly membership. On top of that, I also want to know the breakdown of the number of visits by Singaporeans, including those holding the $2000 membership. Eg. How many visited the Casino only once in the 7 months. How many visited twice, three times, four times…. etc. This is to determine the social impact of the Casinos on Singaporeans. I believe MCYS has all these data and it is time to do a review on the casinos. There are still problems of Casinos providing rolling credits (Casino operators basically turn into money lenders!) and not stating clearly the odds of each different games. But I guess we will have to do it one at a time as it seems that Minister Balakrishnan may not be able to cope with too many things simultaneously. No Race-based Politics in Singapore? During the launch of NSP Malay Bureau last Saturday, a Malay reporter asked me whether NSP is moving towards "race based politics" with the launch of this Malay Bureau. My instantaneous response is, "Aren't we living in a political system full of race based politics and policies already?" Coincidentally, MM Lee was reported talking to foreign correspondent about how Singapore will fall into "race based politics" if we to allow more political liberalization. Let me get this clear here, Singapore under PAP's rule, has already been engaging race based politics all this while! From the HDB racial quota rule, GRC system to setting up of Mendaki, Sinda, CDAC, all these are race-based politics. Although PAP's Rajaratnam has written the National Pledge on "regardless of race, language or religion", but that is all "Highfalutin ideals" in PAP's eyes! And the truth is, the ideal of cultivating a "Singapore Singaporean" has been subtly put off because of the recognition of the racial fundamentals of various ethnic groups in Singapore. That is why PAP starts putting up the HDB racial quota rule, set up racially based Mendaki, Sinda and CDAC... etc. GRC is set up precisely because in PAP's eyes, "minority candidates" (I do not like to use the word minority at all) could not win a single ward seat because of the assumption that the Chinese would be biased and vote according to racial lines. This is in spite of the fact that BOTH PAP's and Opposition's Malays, Indians and candidates of other races have won elections for decades! These changes are initiated basically because PAP realized that it has somewhat lost some support of the Malay and Indian communities back in the 1980s electoral contests. It wasn't a problem for the 1960s or the 1970s. But when Mr. JB Jeyaratnam started to break PAP's total monopoly of power in 1982 by-elections, PAP started to play the race cards. The high concentration of “minority votes” was considered as one of the prime reason why opposition parties in the 1980s were able to score well. Thus the HDB racial quota rule sets in. GRC was set up. Eventually, racially based organizations like Mendaki, Sinda and CDAC were set up as well. Thus, I cannot understand how opposition parties could be insinuated as the ones who will go into "race based politics" when PAP has already covered all these racial aspects! The truth is, any politicians or political parties will not survive politically if one is to concentrate on a single racial issue! This is basically because by being singular racially based, you will lose the support of other races. The ONLY WAY for a political party to win the elections is by winning the TRUST OF ALL RACES! This is why PAP has gone into multiple race-based system with the set up of Mendaki, Sinda and CDAC. Yes, these are race based, but they are multiple race-based. Should we be worried about anyone going into race-based politics? Singular race based politics? Apparently not. That would be the most stupid thing for a politician to do. He will not get support from the other races at all! How could he be taken seriously? I believe most Singaporeans nowadays, regardless of race, language and religion, would not buy that kind of racial rhetoric even from people of their own race. We are an open society with citizens who are exposed to the outside world. We may be concerned about issues that are particularly important to our own racial community but that does not mean that we will go all out to encroach into other races' space. There are still social or even political problems which are specific to different races. This is something we cannot avoid. This is why any political parties who are serious in the long term political development of Singapore, will have to address it in an open manner. We cannot just pretend differences in race don't exist. But we must always bear in mind that we need to apply fairness and critical considerations in a just and balanced manner to all problems face by different races. PAP has jealousy guarded itself as the only party that could deal with race based politics in Singapore. Anybody who dares to challenge this position would normally face "demolition" from its leaders. Jufrie and Tang Liang Hong are those special cases for us to examine closely. Incidentally, both of them represented the same opposition party, Workers Party at different point of time. One would wonder how could two "accused" racial (i.e. Malay and Chinese) chauvinists ever serve the same party at all. Strategically speaking, such deliberate racial divides enhanced by the present the race based political setting, would require any political parties to convince each and every Singaporeans of all different races that they could well represent their interests in parliament, in a balanced way. It is not a simple task to accomplish especially so when PAP has deliberately set the OB markers for all other opposition parties from touching "race based issues" while itself dominates the race based agenda. As the leader of NSP, I feel the need to address such challenges. Forming the Malay Bureau is my first step towards establishing a party which will be seen as a multi-racial party which will take all views from all races into considerations. NSP must be seen to be the other party which is able to take care of all races in helping them to mitigate or voice out their concerns in parliament in a balanced and responsible way. If I could, I would like to form the Indian Bureau for NSP if I could get critical mass of Indian Singaporeans to join us as well. The point I want to make here is that, don't be frighten by PAP's scare tactic on "race based politics". As long as a political party is responsible in dealing with all race based issues in a balanced, fair and just manner, there is nothing wrong to be all inclusive in our approach of forming Malay and Indian Bureaus, just like PAP forming Mendaki, Sinda and CDAC. There might be competing ideas among different races. But I think we should have the wisdom to resolve such differences while working towards our common interests as a Nation. NSP is definitely not going into a narrow path of singular race based platform. In fact, I asked the reporter one simple question, NSP has always been seen as a "Chinese party" in the past. Won't the formation of the Malay Bureau actually diffuse such racially based perception once and for all? Won't it be seen as more racially balanced if we have Malay Bureau as well as Indian Bureau in NSP? How could we be perceived as "race based" political party when we are in fact moving towards in building a multi-racial political party platform? If anyone wants to accuse NSP of being race-based party, they should reconsider us as "multi-race based" party. 1) This is the official launch of Malay Bureau of National Solidarity Party. 2) This is to provide a platform for Singaporeans to gather and discuss on issues important to the Malay community. 3) It also allows issues pertinent to the Malay community to be heard in proper public discourses so as to achieve better understanding among Singaporeans and racial harmony. 4) It also provides a platform for passionate and dedicated Malay Singaporeans to participate in Singapore’s electoral politics meaningfully and contribute to the political development of Singapore. 5) Ms Nor Lella Mardiiiah Binte Mohamed will head the Malay Bureau while Mr. Syafarin Sarif will be the Secretary. They will be the key appointment holders leading a core team including Mr. Ramli as Organizing Secretary, Mr. Yadzeth as Treasurer and Abdul Mr. Salim as Assistant Secretary. 6) With the formation of this Malay Bureau, NSP is ready and determined to send our first Malay candidate into parliament, whether as MP or NCMP. 7) NSP is now confident to achieve its initial target of fielding 20 candidates in the coming elections with this formation of Malay Bureau. 8) We are now working towards fielding 30 candidates as we are now expecting more Malay potential candidates to join us. 9) As long as anyone who has the passion to serve, has the right attitude towards politics as the means of public service and the ability to be the effective voice of the people, we welcome them to join us. I have wanted to write about this issue earlier but couldn't get the appropriate "evidence" in time. But it seems that the PAP has taken a step faster than me this time round. When PAP decided to build these two Casino Resorts (yes, I refuse to fool my readers on the true nature of these resorts by calling them "Integrated Resorts"), they have declared openly that these Casino Reports' primary targets are foreigners/tourists. However, it seems that Casino operators do not agree with the government at all. This brochure from Resort World is distributed ALL ROUND ISLAND. 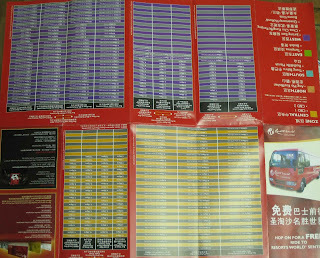 It provides shuttle bus schedules which covers North South East West and Central. Some may think that there is nothing wrong for Resort World to provide free shuttle service for Singaporeans who want to visit the Universal Studio. But wait, take a closer look at the time scheduled. On normal weekdays, the last bus leaving from most "terminal" bus stop is at 10pm while returning shuttle bus service also ends at about 10pm. However, during week days, the Universal Studio closes at 7pm! 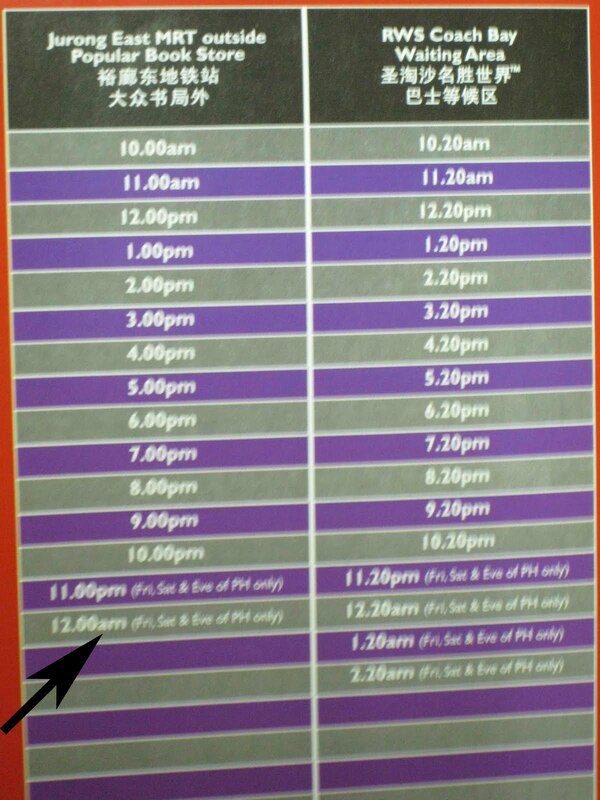 During weekends or public holidays, the timing is even more absurd: last shuttle bus ends at 12am in some places while others ends after 2am! So who do these FREE SHUTTLE BUSES serve? 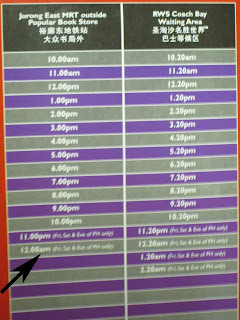 Apparently, only the Casino operates 24 hours! The above are all documented evidences I have gathered. 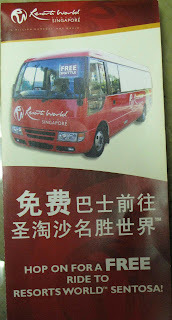 Marina Sands also provides Free Shuttle Service but I do not have the details. 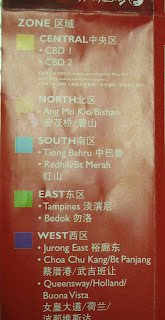 But Sands has the advantage of situated right next to the MRT station. It is obvious that the Free Shuttle Bus service is aimed at local Casino patrons. 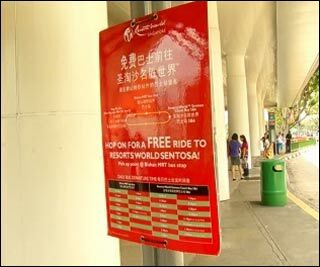 Resort World seems to take the fastest step to "rectify" the situation by declaring that all Free Shuttle Bus service to the heartlands will stop with immediate effect. Is this a sign of self confession even before MCYS completes its "investigation"? Well, does the fault lies only on the Casino operator? It is unimaginable that the authority didn't know about all these scheduled free shuttle bus services at all. First of all, license needs to be issued to these buses to ferry the public. To run such scheduled service round island at different intervals, it will need at least 10 buses for these 5 zones. Did LTA know about such service? The Free Shuttle Bus service has been running for quite a few months. (I first heard about it in May.) Brochures have been distributed island wide. There is even signboard tied on lamp posts at the respective pick up point! How could such an extensive operations escape the ears and eyes of this government? It actually takes months to react to it? I am not too sure how the new law created specially for governing Casino operators say about those operators who breach rules on marketing the Casino to local patrons. But I think it is important for the PAP to keep up to its words that these two Casino Resorts are marketing aggressively to local population. This Free Shuttle Bus service is just the tip of the iceberg. I was told that personalized letters to individuals have been sent to market the Casino. I was even told that credit card holders or some VIPs were given special privileges for visiting the Casino. Are they allowed to do all these local marketing? Casino gambling is a vice, no matter what. While we ban advertising for things like cigarettes, why should such vice be allowed to be marketed to the people? Besides, PAP has reiterated that such Casino Resorts are meant for Foreigners and Tourists but it seems that this is not the case at all! I am a staunch Anti-Casino person. I have delivered a speech back in 5 March 2005 to reason why Casino is bad for Singapore. The PAP has claimed that the successful casino in the world has 80% foreign patrons with only 20% local gamblers. But in Singapore, we have seen that the gamblers in casino here consists of 60% of local gamblers! But yet, they are still marketing the casino to local population! Apparently, the Casinos have broken their promise of focusing on foreign gamblers. They are not keeping to their own term of success, attracting 80% of foreigners but instead, concentrating on marketing to local population! The other area of problem is the huge amount of credits that the casino operators could grant to its patrons. We just realize that one Singapore businessman has lost $26milloin to the Casino. This is mainly because the Casino is all willing to grant credit to this man, almost unlimited credit. I was told that as long as you could put up a $50k deposits, you could possibly get credit terms from the Casino! My question is this, do Casino operators have any finance license to grant such big loans to its patrons? Are the present laws adequate to cope with such extensive loans or credits given by the Casinos? If Casino is allowed to grant such huge amount of loans/credits to its patrons, then it is apparent that it will become a big money lender as well! Shouldn't it be made to abide to existing finance law? Most importantly, will PAP do something about it? BE RESPONSIBLE AND ACCOUNTABLE PLEASE! 1. Senior Minister Goh Chok Tong has finally conceded what the National Solidarity Party (NSP) has been saying all along: that the government’s liberal immigration policy was poorly thought out, and has had an adverse impact on housing plans. In his comments reported by The Straits Times on 7 September 2010, SM Goh offers the implausible excuse that the government was “caught by surprise”. 2. Given that the government sets quotas on the number of foreign workers to be let in to the country every year, it is ridiculous for the government to claim that it was caught flat footed by a sudden surge in immigrants. 3. Mr Mah has said as early back as 2007 that Singapore is planning for a 6.5 million person population within the next 20 years. Apparently, as a Cabinet Minister, Minister Mah is well aware of the direction that this government is heading to. It is thus inexcusable for HDB, under Minister Mah’s charge, not to respond accordingly to the intended population plan. Minister Mah will have to be made accountable for such mismanagement of the housing planning by HDB. 4. SM Goh and the NSP are in complete agreement over one point: the National Development Ministry, helmed by Mr Mah Bow Tan, is the Ministry that should bear the responsibility for the housing bubble that resulted from this surge in immigrants. 5. On the other hand, NSP is doubtful of PAP’s policy of increasing the population size to 6.5million. The falling total fertility rate (TFR) of native Singaporeans means that the government’s race towards the 6.5 million figure will be spearheaded by a further influx of foreigners. Despite the government’s packaging of the 6.5 million figure as a “planning parameter”, Singaporeans will be justified in demanding reassurance given that previous planning parameters have been exceeded, as SM Goh concedes. 6. Singaporeans across almost every demographic have borne the brunt of this poorly thought out policy: low wage workers have seen their incomes decline as foreign workers depress wages, while at the other end young middle income couples have seen public housing continue to rise beyond their means. Every Singaporean taking public transport has seen the reality of a public transport infrastructure bursting at its seams. 7. In light of all of the above, the NSP calls on the government to urgently revise the 6.5 million person population target downwards, and commission an inter-Ministry study with the purpose of accounting to Singaporeans regarding how housing, transport, and social infrastructure can continue to be assured. 8. The NSP also reiterates our stand that new HDB flats should be sold at cost price to citizens. HDB should also consider selling new flats to PR at market price so to ease the demand due to unusual increase in PR population. It has flooded again today, NSP empathize with Singaporeans who have been suffering from these floods which seemingly has become a norm nowadays. Following our recent call for the government to commission a Committee of Inquiry to look into the recently frequent flash floods, the National Solidarity Party (NSP) has researched into possible short-term solutions to alleviate the problem of flooding temporarily for those who are affected. NSP recommends a combination of three affordable and practical measures that the government can implement quickly as a short-term solution to minimise the threats from future flash floods. The three short-term measures are: flood alarm system, “Floodgate” and submersible pump. An effective Integrated Flood Alarm System (IFAS) consisting of Short Message Service (SMS), localized siren and broadcast warnings should be put in place. The government should open up a website for those residents and workers in flood-prone zones who would want to be warned of flash floods via SMS to register themselves there. Whenever a flash flood occurs, the nearest neighborhood police post should deploy personnel to sound off a unique siren around the affected area. Lastly, radio and television broadcast warnings should also be given to drivers and motorists. Lastly, submersible pumps may be distributed to residents and businesses in flood-prone zones. They can be used to pump flooding water out of their premises if all things fail. The Civil Defense or another defense unit should also be equipped, and deployed, with heavy-duty submersible pumps that are able to channel flooding water into a nearby unblocked drain, river, or reservoir, or the sea. NSP empathizes with residents and businesses of their pain in coping with these flooding which seems to become a norm after PUB has turned 90% of Singapore into water catchment area. The damages of the few past flooding have surpassed ten million dollars and we believe it will continue to go up. While NSP believes that the government still needs to commission a Committee of Inquiry to look into long-term solutions, it believes that the above-recommended short-term measures can and should be implemented immediately with government funding in order to safeguard the interests and safety of the residents and businesses in our flood-prone zones. Like many Singaporeans, NSP is shocked to learn that the PAP is only giving due recognition to present NSmen while ignoring those past NSmen who have contributed to the safety and stability of this country. It is easy for the ruling party to say that it is not just about the money. However, the exclusion of those NSmen in Mindef Reserve from such rewarding system has hurt their feelings more than the mere $9000 in question. When the Prime Minister mentioned about this hand out of $9000 to NSmen, many Singaporeans are happy and glad that the PAP has not forgotten of the sacrifices and contributions that Singaporeans have made towards this country. Even though some of us may not get the full amount eventually, but at least it is a token of appreciation by the government that matters. However, we do not expect the PAP to miss out a whole two or three generations of older male Singaporeans who have completed their full cycle of National Service. This leaves a bitter taste in them and it seems to indicate that once they have passed their “useful” time to the Nation, the PAP will just abandon them aside. Such move betrays the cold, clinical pragmatism of PAP rule. It also makes us wonder whether PAP will abandon all of us when we become old and incapable to contribute to the country in time to come! Leave no man behind. This is what NSP believes in as what the Officer Cadet Course would teach all leaders of SAF. This is also the mantra of PAP but it just doesn’t really practise what it preaches.